Tickets are still available for some of the public events related to the visit of His Holiness the XIV Dalai Lama to Emory University Oct. 17-19 in his capacity as Presidential Distinguished Professor. The Dalai Lama will participate in programs on science research and meditation, creativity and spirituality, an interfaith dialogue and a teaching for the Buddhist community on compassion. • "The Creative Journey: Artists in Conversation with the Dalai Lama about Spirituality and Creativity." Internationally known humanitarian and award-winning actor Richard Gere will join Pulitzer Prize-winning author Alice Walker for a discussion on how the arts help us express or uncover our spiritual yearnings and questions. 1:30-3:30 p.m. Tuesday, Oct. 19, Woodruff PE Center. • "Compassion Meditation: Mapping Current Research and Charting Future Directions." This daylong conference brings together scientists and educators for discussions with the Dalai Lama on current research on empathy and compassion, the scientific study of meditation practices for cultivating compassion, and the implementation of such programs in clinical and educational settings. 9:30-11:30 a.m., 1:30-3:30 p.m., Monday, Oct. 18, Woodruff PE Center. • "Teaching to the Buddhist Community: The Nature and Practice of Compassion." In this teaching for the Buddhist communities and general public of Atlanta and the southeastern U.S., the Dalai Lama will explain the nature of compassion and the practices for cultivating it as understood in the Tibetan Buddhist tradition. By explaining the essential role of compassion in the flourishing of human life, this teaching will provide a backdrop for all the subsequent events of the visit. 9:45-11:15 a.m. Sunday, Oct. 17, Woodruff PE Center. • "International Conference on Tibetan Buddhism." This conference will bring together the preeminent leaders, teachers, scholars, translators, supporters, and students of Tibetan Buddhism from both traditionally Tibetan Buddhist areas and western countries to engage in substantive discussion about the current state of Tibetan Buddhism in the modern world and how best to move forward collectively. Oct. 18-20, Emory Conference Center Hotel. View all program and ticket information, as well as sponsorship opportunities for the Dalai Lama's public events. 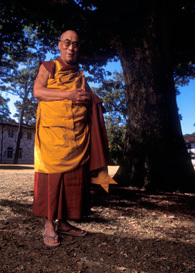 View information about Emory's relationship with the Dalai Lama, as well as related programs and resources. View media information, including credential guidelines and other media-related resources. "The Visit 2010" marks the first return of the Dalai Lama to Emory since 2007, when he was installed as Presidential Distinguished Professor, the first university appointment accepted by the 1989 Nobel Peace Laureate and leader of the Tibetan people. The appointment and his visit this year are part of the continued outgrowth of the Emory-Tibet Partnership, which was founded in 1998 to bring together the best of Western and Tibetan Buddhist intellectual traditions.